Taipei has many night markets! You could say night markets are a way of life for the Taiwanese. They start to open when the schoolkids are out, and when everyone else gets off work. 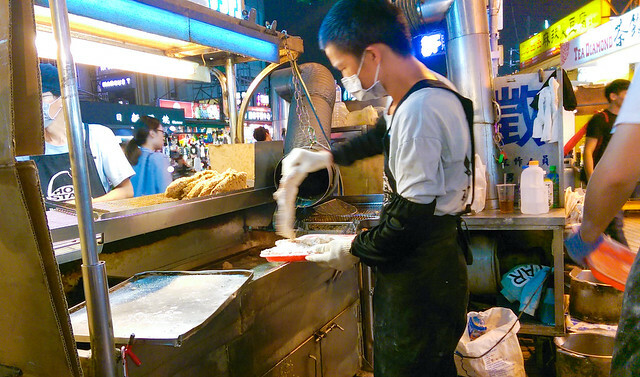 The night market most popular with tourists is Shilin Night Market, and most vendors will start their post from the afternoon till 1am. If you’re getting there by MRT, Jiantan Station is the nearest station, not Shilin Station! More info regarding directions can be found here. 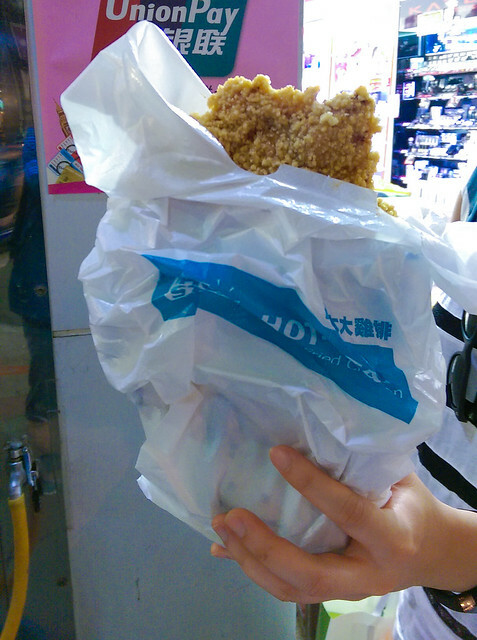 When we got to the night market, we saw lots of people carrying around a big piece of fried chicken! Each piece of fried chicken was NT$70 (apparently price has gone up the past few years). The line wrapped around the vendor, and you can see how they work their magic behind the stand. Orders are taken while in line, and you’re given a bag as a voucher for picking up the chicken when you’ve reached the front of the line. They also ask you if you’d like it spicy or not. We like ours mildly spicy, so they gave it a light coating of five-spice and pepper powder. The fried chicken was as big as our face! In the photo above, my sister is literally holding the chicken from the bottom. The chicken was fried and seasoned like the popcorn chicken we get at most boba places at home (in the US). Except this was wonderfully tender and not overpowered by spices, and the fried batter was crispy and light, not bready and crunchy. The three of us got full from it and couldn’t even finish it! It also went well with our Coco drinks that we got across the street. According to a Taipei Times’ report of 2011, Taiwanese devour more than 250,000 fried chicken cutlets a day. Piled atop each other, that would make a chicken cutlet tower 10 times as tall as Taipei 101, the island’s tallest skyscraper at 508 meters. Go to Hot-star for the original oversized chicken cutlet. The enormous slice of meat, as big as your face, is very moist with a crispy crust. A generous coating of five-spice powder and pepper gives it a kick. Starting as a small counter at Shilin night market, Hot-star is now a Taiwanese food franchise present in [Australia,] Hong Kong, Malaysia, and Singapore.